On Jun e 14, 2014 the ordination of Fr. Frank Kalabat, of the Eastern United States Chaldean Eparchy (Diocese) will be held in Southfield Michigan. Hundreds of thousands of faithful followers across the globe are estimated to watch the live event. 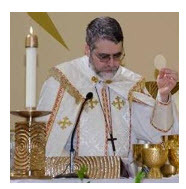 The humble priest, born in Kuwait in 1970, and ordained a priest in 1995, was selected by Pope Francis to succeed Bishop Ibrahim to lead the Chaldean faithful in the United Sates. Born in Iraq, Bishop Ibrahim was named by Pope John Paul II in 1982 to head the American eparchy (diocese) for Chaldeans. It is separate from the Archdiocese of Detroit but still has allegiance to the pope. Known as the Chaldean Eparchy of St. Thomas the Apostle, it once covered the entire U.S. In 2002, the diocese grew so large in divided into a Western and Eastern half of the U.S. There are 105,000 Catholics who are members of the Eastern diocese, said the Vatican news release. Many of them are in metro Detroit, which has the highest concentration of Chaldeans in the U.S.
Fr. Frank recently served as the pastor of St. Thomas Chaldean Catholic Church in West Bloomfield. Known for his inspirational and passionate sermons the modest priest is adored by the community. Fr. Frank will be taking on the name of Bishop Francis and plans to continue his mission to bring Christ into the lives of all. Kalabat will be formally installed among some of Michigan’s most influential religions leaders. In attendance will be Archbishop Allen Vigneron, head of the Archdiocese of Detroit, and numerous other world leaders.